Crawley Town head coach Harry Kewell was delighted with last weekend’s 1-0 victory away at Morecambe. Speaking at his pre-Grimsby Town press conference, he admitted his side relaxed after the Shrimps had a player sent-off in the first half. He was pleased with the way they started the game but admitted they let the home side back into it but of the 90 minutes was happy with the display and clinching the result on the road. The former Liverpool star reckoned the home side, reduced for more than half the game to only ten men, actually had more chances to score than the Reds. 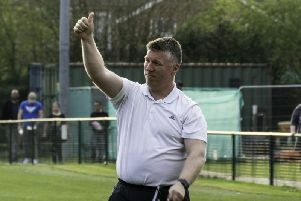 He said: “I was particularly delighted about the way we played. We played well, especially in the first part of the game. “We created a few chances and got our goal and then obviously there was an incident in the game in our favour (Morecambe’s Kevin Ellison sent-off), we took our foot off the pedal and allowed Morecambe to be in an around the game. “This was very dangerous because Morecambe are a very dangerous team. “They were creating chances and they were putting us under pressure. Kewell said his side got back into top gear in the closing stages of the second half. “Towards the end of the game, yes, we created one or two chances and we could have buried them, but we didn’t.